Our Great Danes are combined European/American lines. These gentle giants are family-oriented dogs because we raise them from birth in our own home. 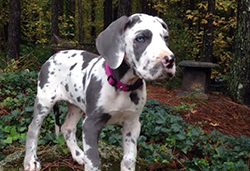 This caring environment prepares your Great Danes to be a part of your family. 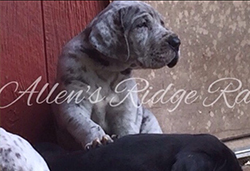 Our experience in genetics enables us to select and breed desired traits and colors in our puppies. We specialize in the unique colors and patterns such as lilac, chocolate, and Tan Point (showing and carriers in both AT and AW). But we also adore out standard colors. All of our babies are special!